The trend towards going solar is most prevalent in the sunny California that “leads the nation in the number of solar schools by state, with 1,946 solar schools and a 489 MW capacity, followed by New Jersey, Arizona, Massachusetts, and New York,” according to the study done by SEIA. These states have set a precedent and example for others to follow. Most schools have a sprawling roof with plenty of space available for panels to be installed. Besides the obvious environment benefit solar provides for our planet, increased solar installations on schools is helping the education system. Schools using solar as main energy source have much smaller electricity bills which means more funds can be allocated towards teachers and resources for the school and students. A study by the SEIA have showed that out of the 125,000 K-12 schools in the countries, around 40,000 to 72,000 could go solar cost effectively saving up to over $1,000,000 over 30 30 by installing a PV system. Solar is an investment for a better future, not just environmentally but for students as well to create a stronger education system through resource allocation. Schools provide a great opportunity for solar which would not only educate students and the next generation on the importance of renewable energy but would unlock important funding to go towards bettering the education system and student success. This study goes over many success stories of how solar systems have benefited the students and their learning opportunities as well as the finances of the educational institutions. 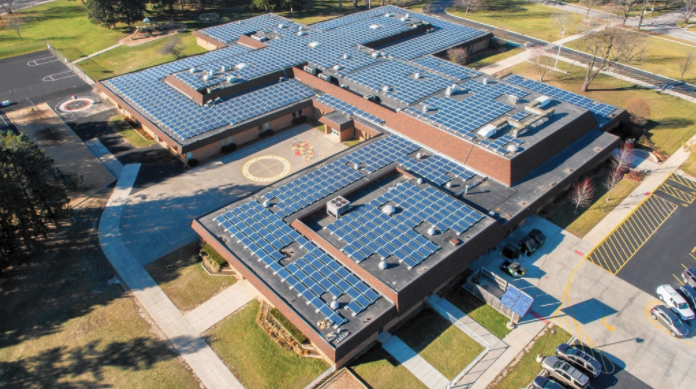 It will be interesting to see how this trend of solar installations on schools grows.